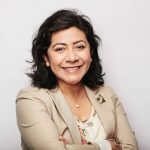 Sulma Guzmán - Centro de los Derechos del Migrante, Inc.
Sulma joined CDM with a wealth of advocacy experience reflecting her lifelong commitment for workers rights and underserved communities through direct litigation and policy work. Prior to CDM, as an attorney at the Public Justice Center’s Workplace Justice Project, Sulma provided legal counsel to the coalition that successfully passed Maryland’s Paid Sick Days law, as well as direct representation of clients in wage-and-hour cases. After passage of the law, Sulma worked on the state-wide implementation and enforcement of the legislation. Sulma is a graduate of the University of California, Hastings College of the Law, and California State University, Stanislaus. Before law school, Sulma served as a Capital Fellow in California’s Labor & Workforce Development Agency. Sulma is admitted to practice law in California, Maryland, and the U.S. District Court of Maryland. Sulma grew up in California’s Central Valley and is the proud daughter of farmworkers.